I love stylish chess sets, and am now thinking about an interior design scheme to accomodate a couple of great sets that I discovered on a trawl of the Internet this afternoon. 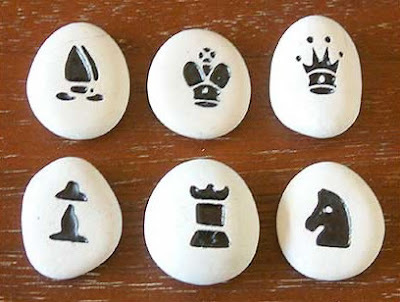 The first, a Sandstone chess set, 'Nature Does Battle' , created by Balinese artist Daniel Wijaya, has the pieces inset onto sandstone pebbles. It's small but exquisite. 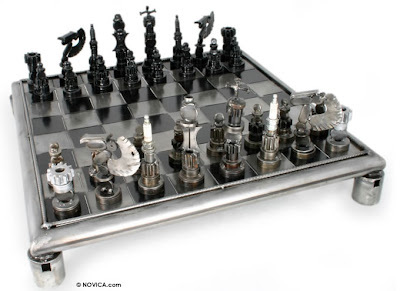 The second, the Auto part chess set, 'Rustic Warriors' , is part of a series by Mexican artist Armando Ramirez. It's a completely different beast made from recycled car and machinery parts: it boasts a 5.7 inch king and weighs in at over 20lbs. They are both available online from Novica.com , a store run in conjunction with National Geographic, that sources its products direct from artisans around the globe. They have a large number of different sets and if you hurry are offering a $10 discount to new customers, quote discount code: NOVICA243.